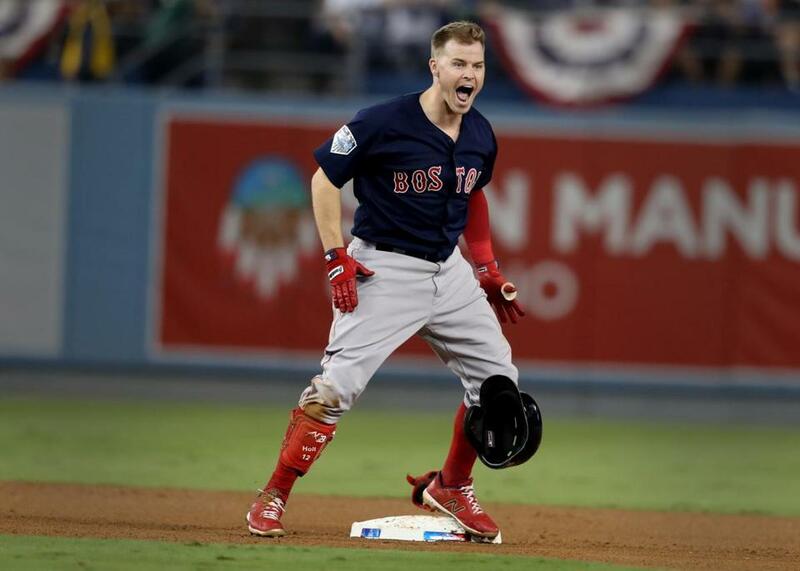 Brock Holt reacts after hitting a double in the ninth inning. 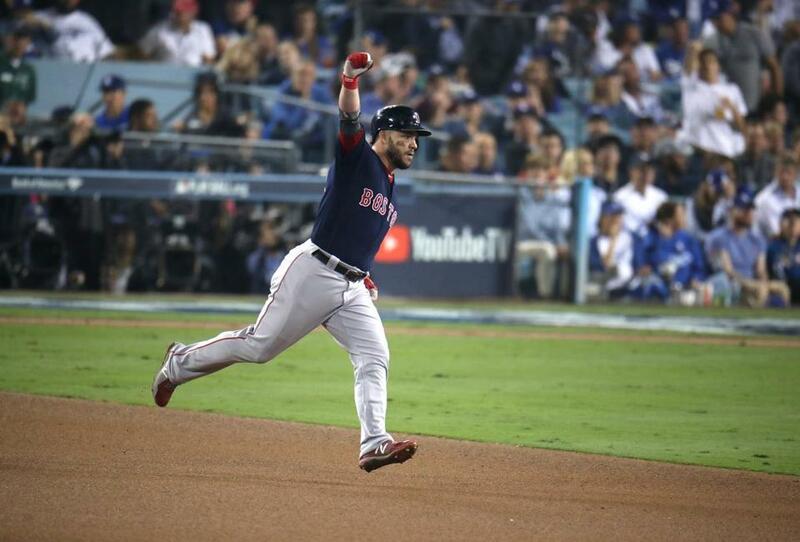 The Red Sox came back from a 4-0 deficit to defeat the Dodgers, 9-6, in Game 4 of the World Series. Boston now holds a 3-1 advantage in the series. #RedSox are 6-1 on the road in the postseason, scoring 51 runs. Bottom: Craig Kimbrel took the mound for Boston and walked Brian Dozier. Enrique Hernandez then hit a two-run homer to trim the Sox’ lead to 9-6. Max Muncy grounded out for the first out of the inning. Justin Turner singled on a base hit to left field. Manny Machado grounded out, and Turner advanced to second. Cody Bellinger worked a full count and popped out to end the game. 7 ER on 9 H in 10 postseason IP for Kimbrel. Like Jansen, Kimbrel was pushed last night - 28 pitches, and his stuff showed less finish in the second inning. He?s on fumes. All those insurance runs look huge after Kimbrel gives up a massive two-run homer to Hernandez. Top: Dylan Floro came in for Kenley Jansen. Eduardo Nunez popped out in foul territory on Floro’s first pitch. Brock Holt then doubled on a bouncing grounder that stayed fair down the third-base line. Rafael Devers, pinch-hitting for Sandy Leon, singled up the middle to drive in Holt, putting the Sox on top 5-4. With a runner on first and one out, Blake Swihart, pinch-hitting for Joe Kelly, grounded out. Devers advanced to second. Floro intentionally walked Mookie Betts to put runners on first and second. Alex Wood replaced Floro to face Andrew Benintendi, who reached first on a soft-hit grounder to load the bases. Then Kenta Maeda replaced Wood on the mound. Steve Pearce then hit a three-run double. Maeda intentionally walked J.D. Martinez to put runners on first and second. Xander Bogaerts singled on a line drive into left-center to drive in Pearce, extending Boston’s lead to 9-4. Martinez advanced to third. Eduardo Nunez flied out to end the five-run ninth inning. Down 4-0, the #RedSox have scored eight runs in a row. A 10th-round pick yielded Santiago Espinal, who yielded Steve Pearce. A 14th-round pick yielded Jalen Beeks, who yielded Nathan Eovaldi. Those later-round finds have an awfully big impact right now. Devers has 9 RBIs in 10 postseason games this season and 14 in 14 games in his career. People always say young players struggle to pinch hit. Devers Just turned 22, so perhaps he?s mature enough for the role now. Red Sox up, 5-4. #coralytics are back. Red Sox are going for the win with Holt on 2nd, which means Blake Swihart is ready for his World Series closeup behind the plate. Bottom: Joe Kelly remained on the mound. Manny Machado singled up the middle to open the inning. Cody Bellinger struck out swinging for the first out. On a grounder up the middle from Yasiel Puig, Brock Holt got the forceout at second, but the throw wasn’t in time at first. With a runner on and two out, Chris Taylor’s grounder rolled past a diving Eduardo Nunez for a single. Puig advanced to third. Yasmani Grandal struck out swinging to end the inning and leave two runners stranded. Kelly?s spinning some nasty curveballs. Gets Bellinger with a swing/miss for the K on his 21st pitch. Benintendi was too slow to that ball. Can't let Puig go first to third on a single to left. Puig dogged it to first and it was nearly a double play. Then he does that. Go figure. Top: Kenley Jansen, who worked two innings in Game 3, took the mound for LA. After Andrew Benintendi grounded out, Steve Pearce hit a solo bomb to tie the game. J.D. Martinez struck out swinging and Xander Bogaerts popped out to end the inning. Steve Pearce celebrates his solo home run while rounding second base in the seventh inning. Steve The Microwave Pearce ties it with the solo homer off the somewhat cooked Kenley Jansen, whose mid-year HR vulnerabilities are back. Obviously, the Dodgers best setup men got pushed hard last night, but asking Jansen for a second-straight night of six outs is surprising. Bottom: Joe Kelly took the mound for Boston and struck out Joc Pederson to open the inning. After Enrique Hernandez lined out, Max Muncy singled on a base hit to left field. Justin Turner popped out to end the inning. Top: Rich Hill remained on the mound for LA and walked Xander Bogaerts on six pitches. Hill then struck out Eduardo Nunez on three pitches, his seventh K of the night. Hill was replaced by lefty Scott Alexander, who then walked Brock Holt on four pitches to put runners on first and second. Righty Ryan Madson replaced Alexander on the mound. Jackie Bradley Jr., pinch-hitting for Christian Vazquez, then flied out to shallow right. Runners did not advance. 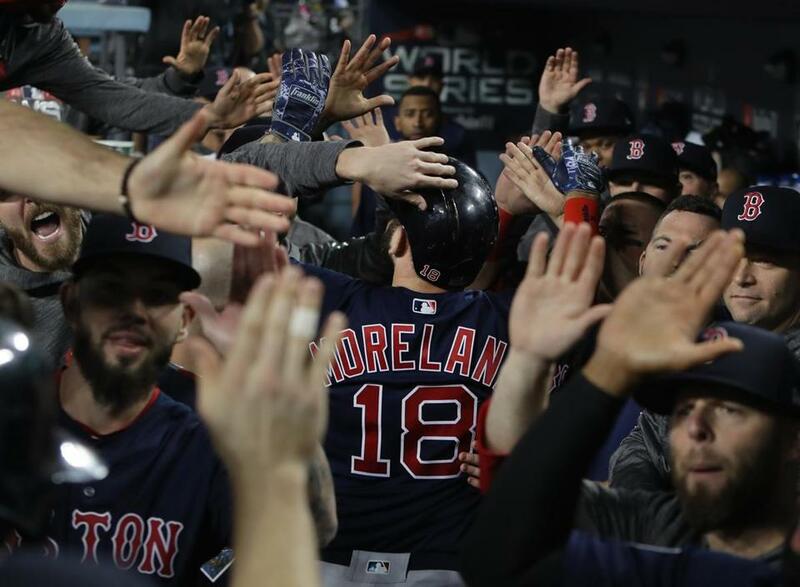 Mitch Moreland, pinch-hitting for Matt Barnes, blasted a three-run homer right-center to trim the Dodgers’ lead to one. Mookie Betts grounded out to end inning. 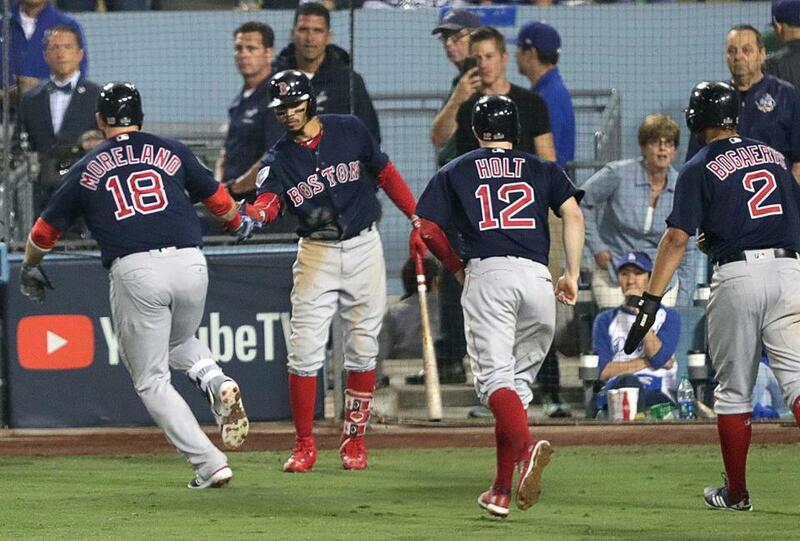 Mitch Moreland celebrates his home run with Mookie Betts as Brock Holt and Xander Bogaerts look on. Mitch Moreland is mobbed in dugout after hitting a three-run home run in the seventh inning. 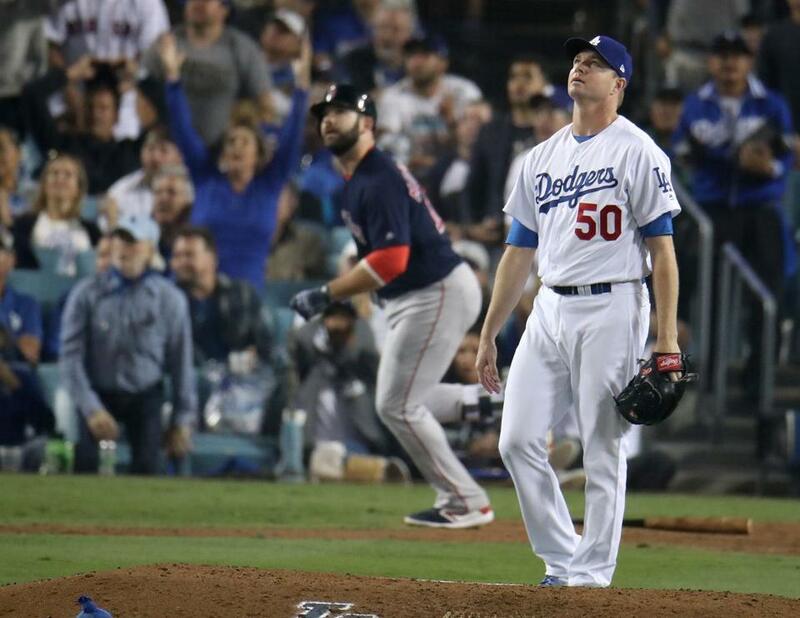 Dodgers pitcher Ryan Madison and Mitch Moreland (back center) watch Moreland's three-run home run in the seventh inning. Mookie Betts tapped a ball back to the mound, barely jogged a few steps and peeled off to the dugout. Can't recall seeing that before. 0 for his last 11, 12 of 58 in the postseason. Looks dispirited. Mitch Moreland with a titanic blast to right field. I mean, that was majestic. Sox back in it, 4-3. Ryan Madson probably shouldn?t be making too many more appearances in meaningful situations. 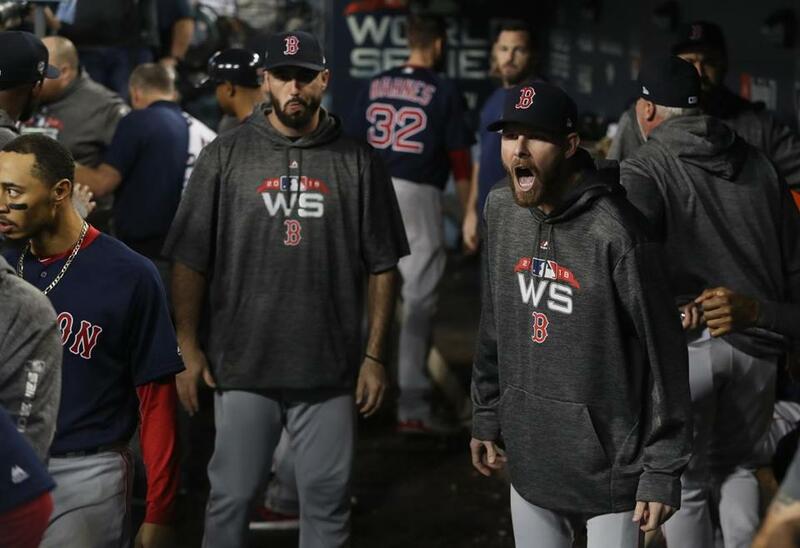 After the Dodgers’ four-run sixth inning was over, Chris Sale screamed "Let's go" to teammates in the dugout. Bottom: Eduardo Rodriguez returned for the sixth and opened the inning by drilling David Freese in the leg. Freese took first and was replaced by pinch-runner Enrique Hernandez. Rodriguez then struck out Max Muncy in a three-pitch at-bat: 87 m.p.h. cutter, 92.2 m.p.h. four-seam fastball, and an 86 m.p.h. slider. Justin Turner then doubled on a grounder down the third-base line to put runners on second and third. Rodriguez intentionally walked Manny Machado to load the bases. Cody Bellinger hit an infielder grounder that Steve Pearce threw to the plate for the forceout at home. Catcher Christian Vazquez’s throw back to first, however, got away from Pearce, allowing Turner to score. Machado advanced to third, and Bellinger reached first. With runners on the corners and two out, Rodriguez remained in the game to face Yasiel Puig, who launched a three-run homer to give the Dodgers a 4-0 lead. Rodriguez threw his glove on the mound following the blast. Matt Barnes replaced Rodriguez on the mound, but walked Chris Taylor on six pitches. Austin Barnes struck out swinging to end the inning. 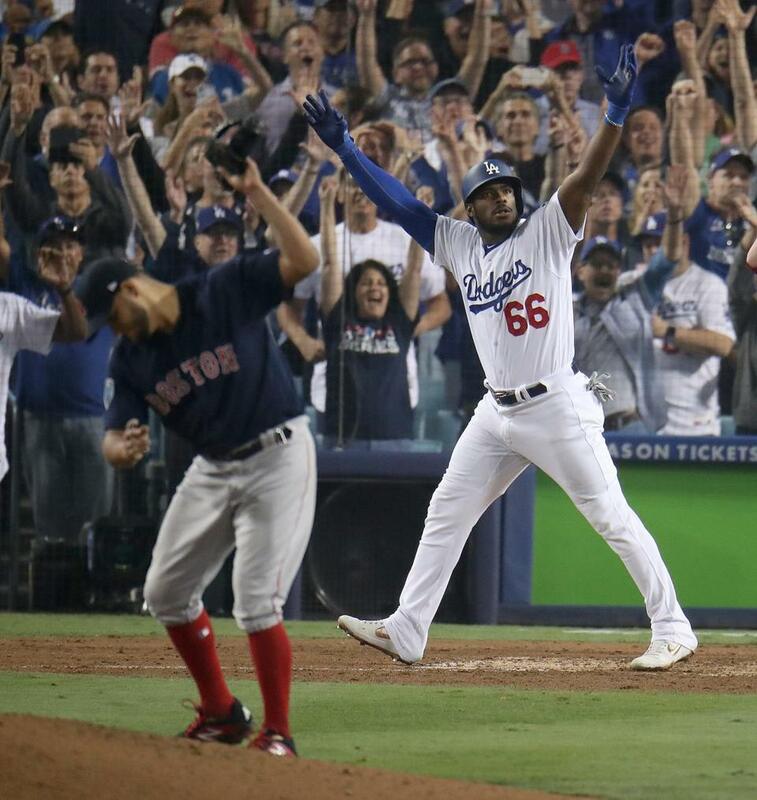 Yasiel Puig celebrated his three-run home run while Eduardo Rodriguez threw his glove to the ground in the sixth inning. Rodriguez had a hell of an outing, and it?s unfortunate that the final (and probably lasting) image from it will be that reaction. Three run-scoring errors in the last two games. Vaquez had to step out to get a lane and didn't. Turner pulls a grounder for a double down the 3B line. Remember, Nunez lost range due to the ankle stuff. Not an easy play, but some 3Bs make it (or at least stop the ball). Instead, it's a double for 2nd/3rd, one out, and the game suddenly feels like it hinges on this inning. Rodriguez?s first slider of the game comes on his 84th pitch, utterly flummoxing Muncy for a called K. Great pitch call by Vazquez. 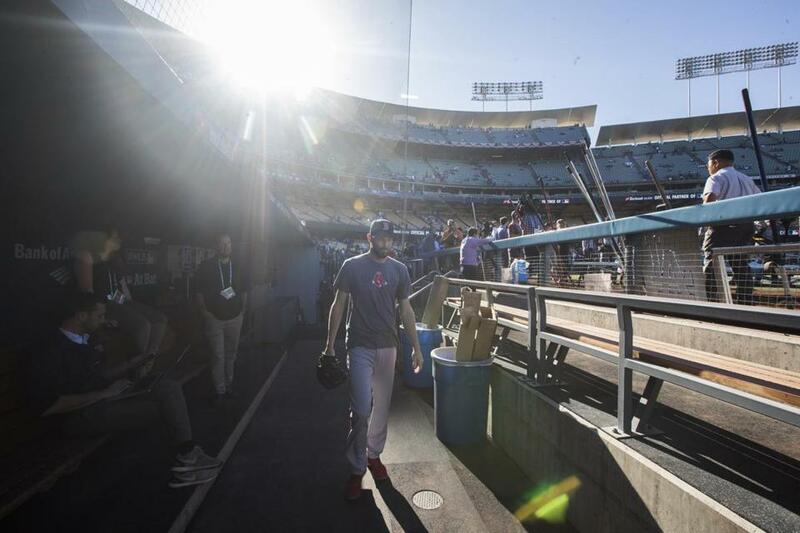 Top: Rich Hill retired the side in order: Andrew Benintendi grounded out, Steve Pearce lined out to left field, and J.D. Martinez also lined out. Benintendi does not have a hit in his last seven at-bats, including three tonight. Hill has given up just one hit through six innings. His pitch count: 82, 53 for strikes. Bottom: Eduardo Rodriguez retired the side in order: Chris Taylor struck out (Rodriguez’s fifth K of the night), Austin Barnes grounded out on the second pitch of his at-bat, and Rich Hill grounded out to end a six-pitch at-bat and the inning. Rodriguez’s pitch mix in the frame: One cutter, one changeup, two two seamers, nine four seamers. His pitch count: 80, 51 for strikes. Five shutout innings and 80 pitches for Eduardo Rodriguez. Better than what anybody could have reasonably expected. He had not started a game since Sept. 20. Top: Brock Holt grounded out on the second pitch to start the inning. Christian Vazquez, two pitches after hitting a foul ball that was very close to being a home run, singled on a line drive to left. Eduardo Rodriguez struck out looking, and Mookie Betts flied out to the warning track to end the inning and leave Vazquez stranded. Rich Hill’s pitch count: 70, 45 for strikes. The Red Sox have two runs in the last 23 innings and none in the last 10 innings. Betts just misses with the warning track flyball. The Red Sox have some hard contact vs Hill, but not a lot to show for it. Dodger Stadium (especially at night) plays very different than even cold Fenway. Vazquez tried to Fisk his flyball inside the foul pole, but it hooks left. He's been on HIll, though. And indeed, Vazquez singles to left for the first Red Sox hit. Leadoff man on, but Cora stays with Rodriguez. Bottom: Lead-off man Justin Turner singled to right field, the base hit coming off of a 94.1 m.p.h. two-seam fastball. Eduardo Rodriguez then struck out Manny Machado to end an eight-pitch at-bat, Rodriguez’s third K of the night. Cody Bellinger, who fouled a ball off of his right shin, prompting a visit from the trainer and manager Dave Roberts, struck out swinging. Rodriguez got him on an 87.8 m.p.h. cutter for his fourth K. Yasiel Puig popped out on the first pitch to end the inning. Rodriguez’s pitch count: 67, 43 for strikes. 4 shutout innings for Eduardo Rodriguez. When asked pre-game now long he could go, Cora mentioned it was a NL game. Puig tried to ambush a fastball and pops up on the first pitch. Rodriguez escapes, stranding Turner, with 19 pitches. He showed a willingness to mix in the cutter/changeup (at a time when his velo has backed down), and pitched his way through a fourth scoreless inning. 2nd time through the order and the Dodgers are getting better swings vs Rodriguez, with the pitch count escalating more rapidly and his pace slowing. Top: J.D. Martinez struck out swinging for the first out. Hill induced two swings and misses in the at-bat, both on four-seam fastballs. Martinez has now struck out four times in this series. For context, he struck out four times in five ALCS games and did not strike out in the ALDS. Xander Bogaerts then grounded out for the second out. He has one hit and has struck out five times in 17 at-bats this series. Eduardo Nunez struck out swinging to end the inning, Rich Hill’s fifth K of the night. Hill’s pitch count: 57, 36 for strikes. 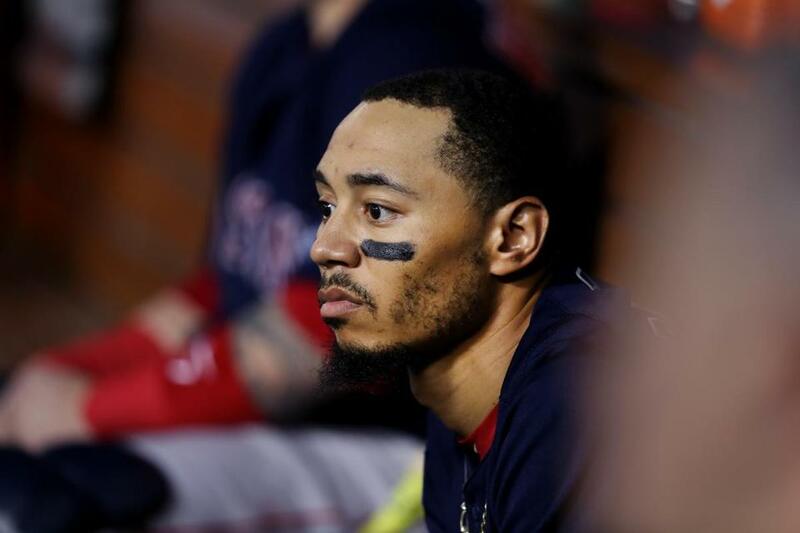 Mookie Betts in the dugout during the fourth inning. Bottom: Eduardo Rodriguez retired the side in order: Rich Hill’s bunt popped out to first, David Freese flied out to right, and Max Muncy, in a seven-pitch at-bat, flied out to left. Rodriguez’s pitch mix in the frame: five cutters, four four-seam fastballs, and two two-seam fastballs. He touched 95.4 m.p.h. on his four seamer. Rodriguez’s pitch count: 48, 31 for strikes. Top: Hill pegged Rodriguez on the elbow/forearm with an 86.3-mile per hour fastball to put a runner on first. Rodriguez winced after getting hit by the pitch. Mookie Betts hit a slow roller down the third-base line, and Rodriguez was forced out at second on a throw by Justin Turner. Betts reached first. Andrew Benintendi and Steve Pearce both popped out to end the inning. Hill’s pitch count: 46, 27 for strikes. The Red Sox are still looking for their first hit off of Hill after 3 innings. Bottom: Cody Bellinger grounded out on the first pitch of the frame, a 92.8 two seamer, before Yasiel Puig flied out to center. Chris Taylor then recorded a base hit off an 87.8 m.p.h. changeup, sending a line drive to left field. Austin Barnes was called out on strikes to end the inning. Eduardo Rodriguez got him on a 94.1 m.p.h. four seamer, an 88.2 m.p.h. changeup, and an 89.9 m.p.h. cutter. Rodriguez’s pitch count: 37, 23 for strikes. Strong sequence from Rodriguez to finish Barnes with changeup (swing/miss) and backdoor cutter for a K.
Top: Xander Bogaerts popped out on the first pitch of the inning, an 82.9 m.p.h. four-seam fastball. Eduardo Nunez then struck out on three pitches, swinging and missing on a 90.8 m.p.h. four seamer for the K, Rich Hill’s third of the game. Hill walked Brock Holt on five pitches to put a runner on first for the second straight inning. Christian Vazquez flied out to the warning track to end the inning. Hill’s pinch count: 32, 19 for strikes. In 2012, Rich Hill was rehabbing from Tommy John in the Red Sox system. He came back from High A Salem raving about Christian Vazquez, convinced he was an absolute star-in-the-making behind the plate. Vazquez got a middle-middle 90 mph fastball from Hill - he's thrown a few of those - and came up just short of driving it out of the park. Bottom: Eduardo Rodriguez struck out David Freese on four pitches for the first out, getting Freese to swing and miss on the final two strikes: A 94 m.p.h. two seamer and a 94.7 m.p.h. four seamer. Max Munch grounded out after a seven-pitch at-bat, then Rodriguez walked Justin Turner on a seven pitches. Manny Machado flied out to right-center end the inning. Rodriguez’s pitch count: 24, 14 for strikes. Rodriguez is through a scoreless 1st. He threw hard, but because he didn't incorporate his changeup (he threw 2), Dodgers synced the velo , fouled off 6 pitches, and drove up the pitch count to 24. It's like Kelly: It's a great fastball if hitters must respect the change. Rodriguez has topped out at 96.5 mph in the first inning, tied for his highest velocity on any pitch this year. He threw 2 pitches with that velocity on 5/10 against the Yankees. Rodriguez opens with four straight fastballs, all 94-95, all up and away, getting two swings/misses en route to a K of Freese. So, he's kept his fastball from last night with him to start. 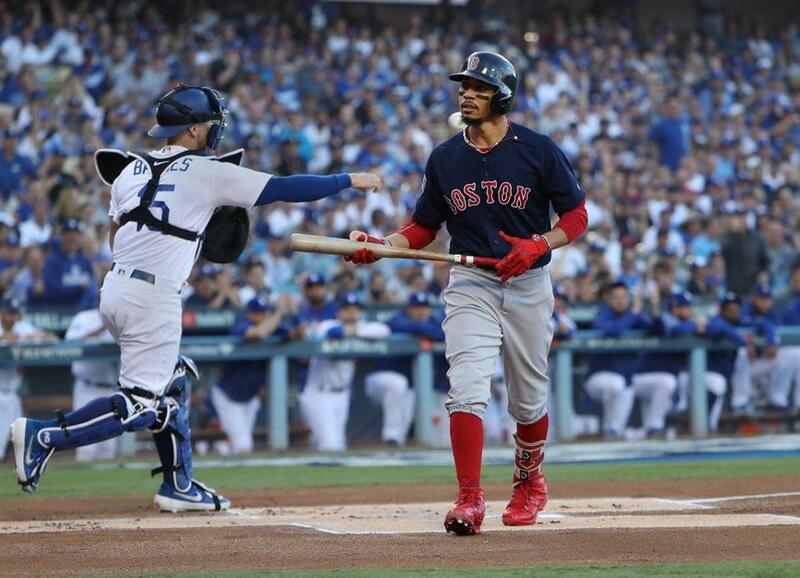 Top: With Rich Hill on the mound, Mookie Betts struck out swinging to open the game. It was a six-pitch at-bat in which Hill fired three curved balls and three four-seam fastballs. Hill got Betts on a 75.6 mile-per-hour curveball. Andrew Benintendi followed that up by flying out to left field before Hill walked Steve Pearce on six pitches. J.D. Martinez struck out swinging for the final out of the frame. Martinez fouled off on a 75 m.p.h. four seamer and then swung and missed at a 7.4. m.p.h. curveball and a 90.1 m.p.h. four seamer. Hill’s pitch count: 19, 12 for strikes. Martinez swung and missed at a middle-middle 90 mph fastball from Hill for the final out of the inning. Hitters have to pay so much respect for his curve that his 90 mph -- particularly given its high spin rate -- players way, way up. Betts opens with another K - with Hill alternative fastballs and curveballs before doubling up on the curve. Hill did a great job of pitching in and away. Betts might have expanded the zone on a borderline curve for strike 3. Rich Hill struck out two in the opening frame. Mookie Betts walked off after striking out in the first inning. 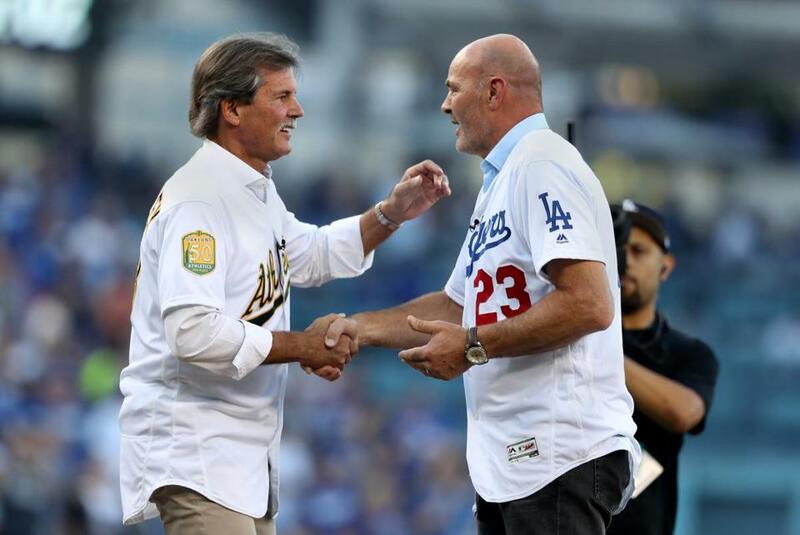 Dennis Eckersley and Kirk Gibson before Game 4 . Dennis Eckersley, always a lot of class. He's throwing out the first pitch to Kirk Gibson. How many in his shoes would do that? Pretty cool. Kobe Bryant is introducing the Dodgers lineup. The grass at Dodger Stadium may look nice on TV but the players said it was very spongy. By the end of the game last night there were divots everywhere. 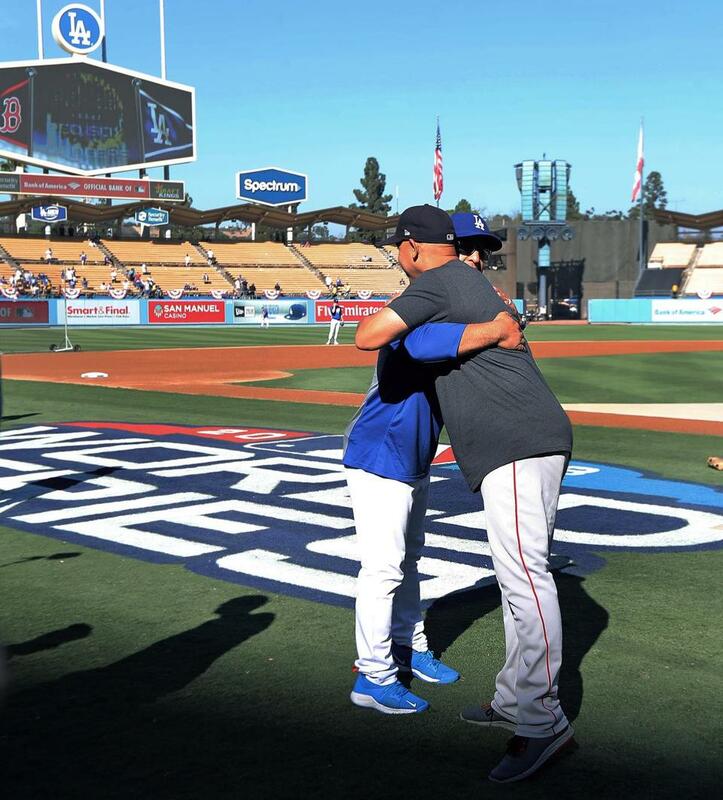 Dodgers manager Dave Roberts (left) and Red Sox manager Alex Cora (right) ran into each other by chance on the field around two and a half hours before the first pitch of Game 4 and they exhanged a hug. A view from the visitors’ dugout at Dodger Stadium. 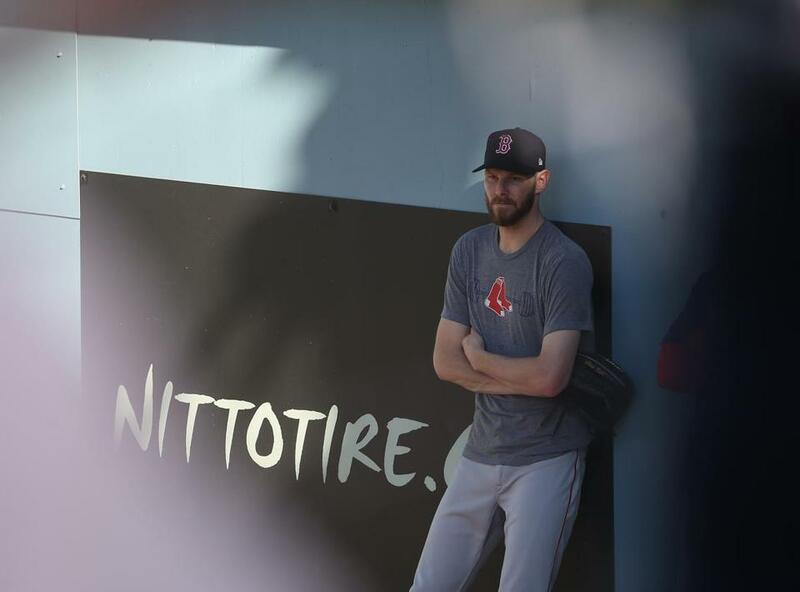 Red Sox pitcher Chris Sale before the game. 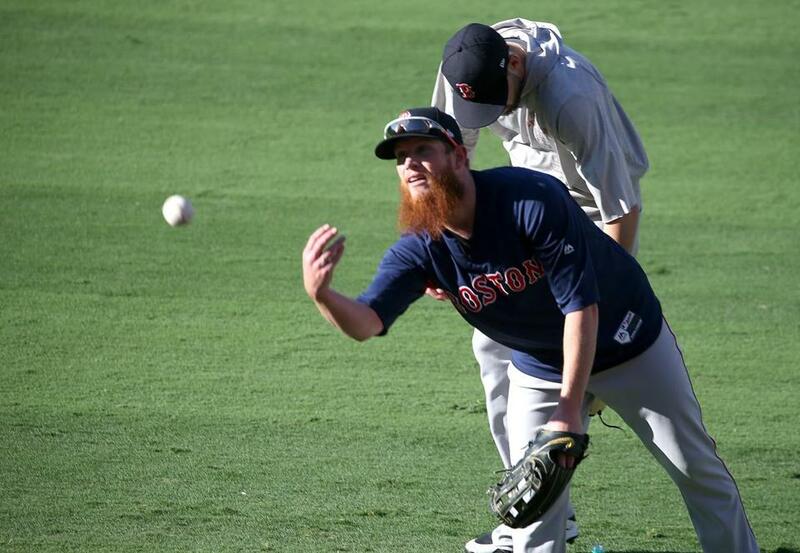 Red Sox pitcher Craig Kimbrel tosses the ball before the game. 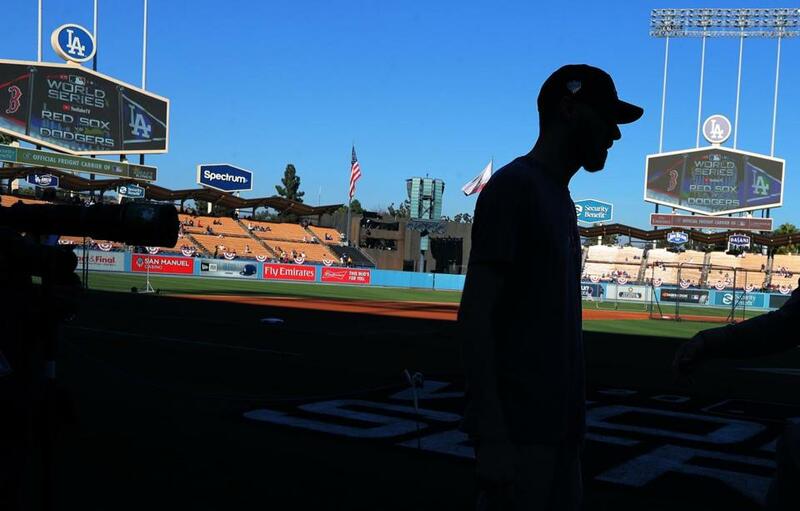 Chris Sale is silhouetted with the outfield at Dodger Stadium in the background. 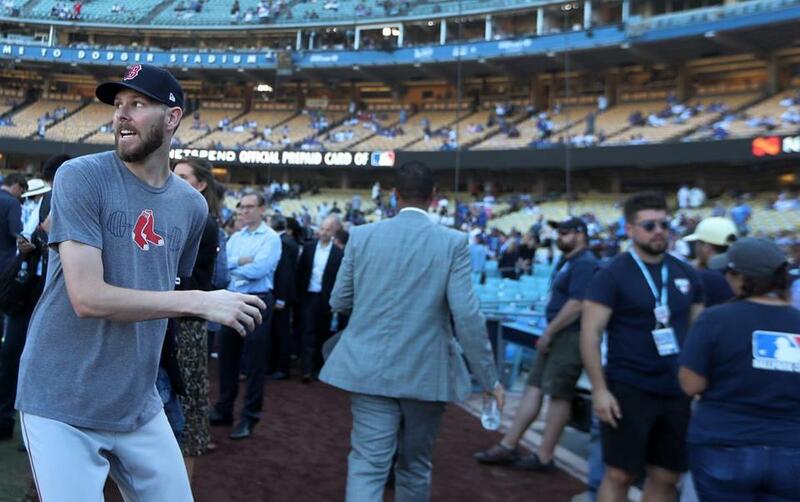 Red Sox pitcher Chris sale was hustling off the field to get to his pregame press conference when someone he knew shouted out to him, and he quickly turned around and went back to speak to him. 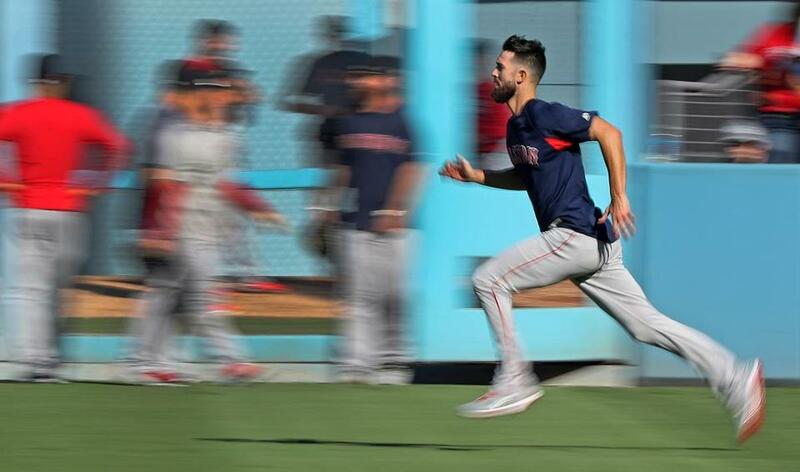 Red Sox pitcher Rick Porcello got in some running in the outfield before Game 4. ■ LHP Eduardo Rodriguez (0-0, 6.23 ERA) and LHP Rich Hill (0-0, 2.61 ERA) are the starting pitchers. ■ Rodriguez, who is making his first career playoff start tonight, pitched ⅓ of an inning in Game 3, facing one batter and throwing six pitches. In 13 career appearances against NL teams, Rodriguez is 5-2 with a 3.46 ERA. In four appearances against NL teams this year, he is 2-0 with a 1.46 ERA. ■ Only Chris Sale and Nathan Eovaldi are not available to pitch for the Sox tonight. 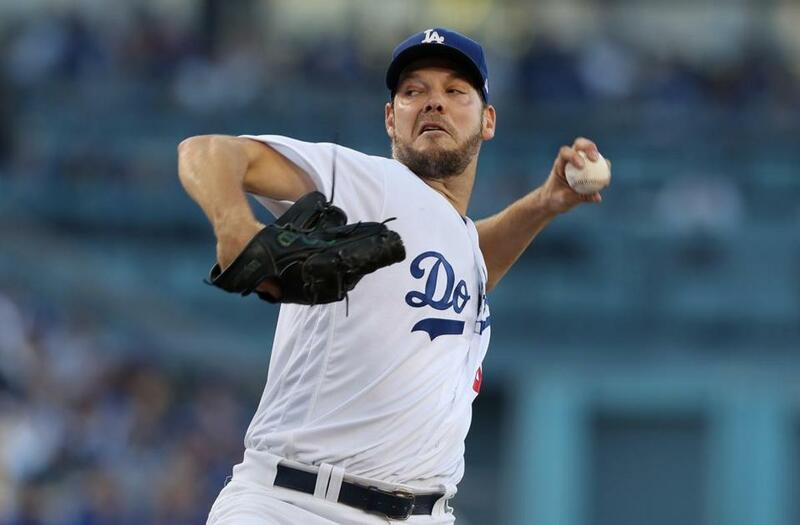 ■ Hill was scheduled to be the starter, then the Dodgers said after Game 3 that the starter was TBA, then on Saturday they named Hill the starter. Hill did not pitch in Game 3. Rich Hill is a tough matchup for the Red Sox. Red Sox ranked 29th in MLB in average (.155) and slugging (.246) vs LH curveballs. Bradley was 1-for-17 vs LH curves, Benintendi was 1-for-16. ■ Andrew Benintendi replaces Jackie Bradley Jr. in the lineup. Benintendi is in left field, Mookie Betts in center, and J.D. Martinez in right. Cora says the Red Sox feel Benintendi is a better matchup vs lefties and Bradley will be ready for hard throwers later. He acknowledges Red Sox ?need to get the top of the order going.? ■ In Game 3, LA and Boston combine to set a postseason record for most players used (46) and most pitchers used (18). Sox pitchers Chris Sale and Drew Pomeranz and Dodgers pitchers Rich Hill and Hyun-Jin Ryu were the only four of 50 active players who did not play. ■ Check out Peter Abraham’s full game preview for more notes and nuggets. Cora got the team together last night ?to let them know how proud I was. That was epic. ... I made a point of letting Nate know that was outstanding. ... There?s been some powerful moments. That was a powerful moment, watching Nate compete on that stage.? Cora says that In Game 3, ?for the first time in a while, the game sped up? on Devers, who he saw swinging ?harder, harder, harder.? Hence, the use of Nunez as a PH when contact was needed. Cora says that the Red Sox are comfortable that they have 27 outs, ?maybe more,? from the pitching staff. Only Eovaldi is unavailable. Cora amended his statement, and just said Sale isn?t available tonight.